In a unique demonstration of customer obsession, Vodafone Ghana has introduced the widest range of BlackBerry packages to suit every customer, including Ghana's first and only 'pay as you go' BlackBerry service. The 'Life Is for Connecting' campaign is in response to the fact that although Ghanaians use the internet in different ways, they still expect the best value. Carmen Bruce-Annan, the Head of Corporate Communications at Vodafone Ghana, explained why customers get the best BlackBerry deals at Vodafone. "Vodafone is the only network that offers a 'pay as you go' option on BlackBerry, and offers the most exciting premium complete and social packages at competitive prices. Having the widest range of BlackBerry handsets and packages also means that we have a service to suit everyone, so we are encouraging our BlackBerry customers to recommend our service to their family and friends, so they can share the superior experience of BlackBerry service from Vodafone." Earlier this year, Vodafone launched an internet campaign with the objective of educating Ghanaians on how the internet can empower them and transform their everyday lives. The BlackBerry campaign is the next phase in encouraging Ghanaians to connect to the internet, so they can experience the benefits of the internet. Carmen Bruce-Annan further explained: "For our customers who use a BlackBerry, it very quickly becomes an invaluable part of their everyday life, because the power of the internet keeps them constantly connected to the things that matter most to them, whether it's work, career or family. "In addition, it is a phone that is so simple to use, so we are encouraging Vodafone customers to be a part of our internet revolution, which is all about giving Ghanaians an affordable opportunity to be all they can be, through the power of the internet." Vodafone customers can access information on the full range of BlackBerry services by dialing *500# from their handset. 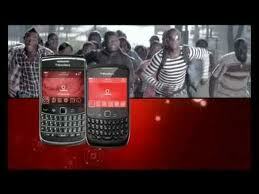 The Vodafone BlackBerry is competitively priced and available at all Vodafone retail shops.